We recently had the joy of meeting with a client at their shared office space in Brighton. Sian and I were kicking off a new project with this particular client by hosting a ‘Download Day’. This is how we always start a Design & Build project – we spend a full day asking questions and taking notes on our client’s business, customers, market, brand, competitors, and marketing history in order to create a marketing plan that meets their needs. We were expecting a Regus-style building with the usual water coolers and bland décor. But, we were gorgeously surprised by ‘Spaces’. This chain of co-working venues was started in Amsterdam and is gradually spreading here. The shared spaces are comfortable, well designed and beautifully appointed. But, I’m not here today to pipe on about the lovely décor, I’m no Kevin McCloud. Instead, what I want to share with you is the tone of voice employed by the Spaces brand in its written materials. You’ll have read my previous blogs about tone of voice, and how having a consistent ‘sound’ to your written materials will help to reinforce your brand values and build trust with your audience. 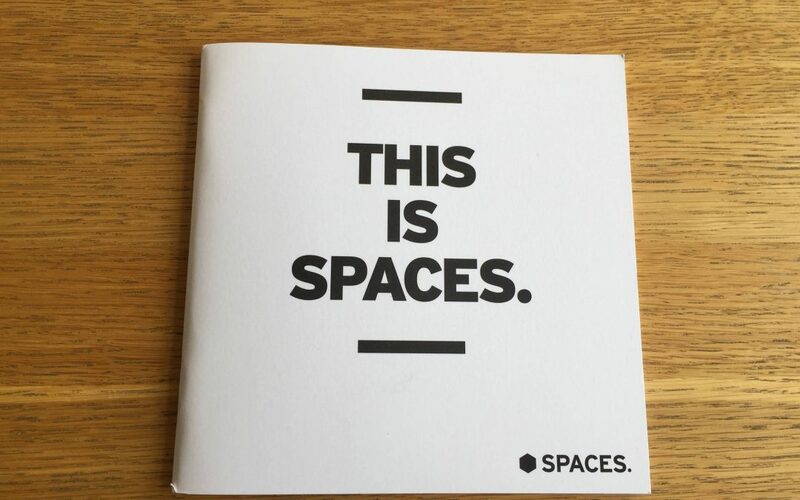 I picked up a brochure while I was there so I could share some of the ‘Spaces’ writing with you. It’s such a wonderful example of the use of key messages and a reassuringly consistent tone of voice. These two techniques help the reader to identify whether they are in the right place, and if this is the ‘space’ for them. Can you see how clearly this copy outlines the Dream Client in the first paragraph? The message is: if this describes you, our co-working site could be a the perfect place for you. In the second paragraph the content clearly helps the reader recognise the ‘problems’ that he or she might be dealing with in their current working environment (i.e. a lack of inspiring community, support staff or great coffee). The message is: this is how we help people, if you need help with this, we are the right place for you. The tone of voice is bold, straight to the point, and motivating. I love it. 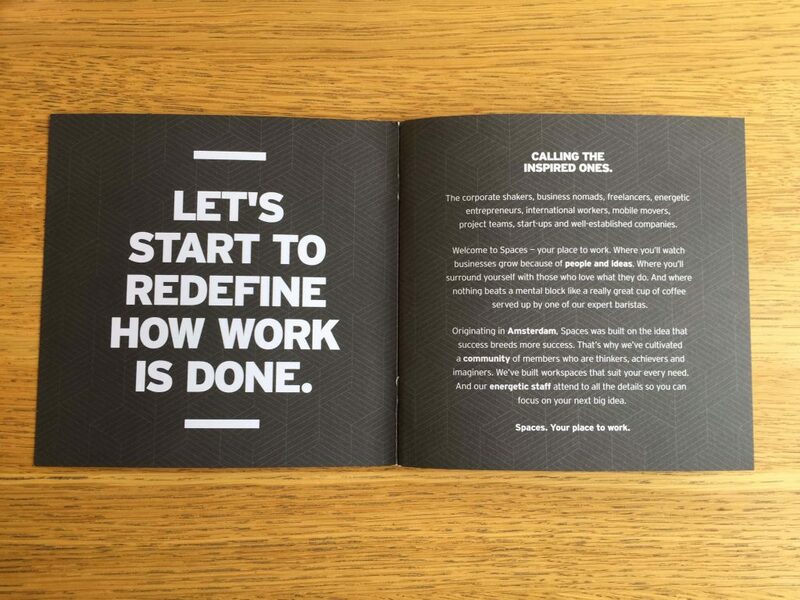 And, here’s how the great design marries with the text – the monochrome style reinforces the boldness of the language. But, also, because the design of this piece is so simple, without images, you haven’t yet seen the look of the environment, it drives your curiosity, making you desperate to turn the page, keep reading and find pictures of the place, to see what all the fuss is about. While I was on site I visited the ladies’ toilet (sorry for the intimate detail, its purpose will become clear) and spotted something simply wonderful (nice soap, but that wasn’t it). A wonderfully worded sign, employing the brand values perfectly, and really getting the message across. I couldn’t help but compare it to the snippy, snide, condescending notice that you might see in a similar location. Here it is for your delectation! 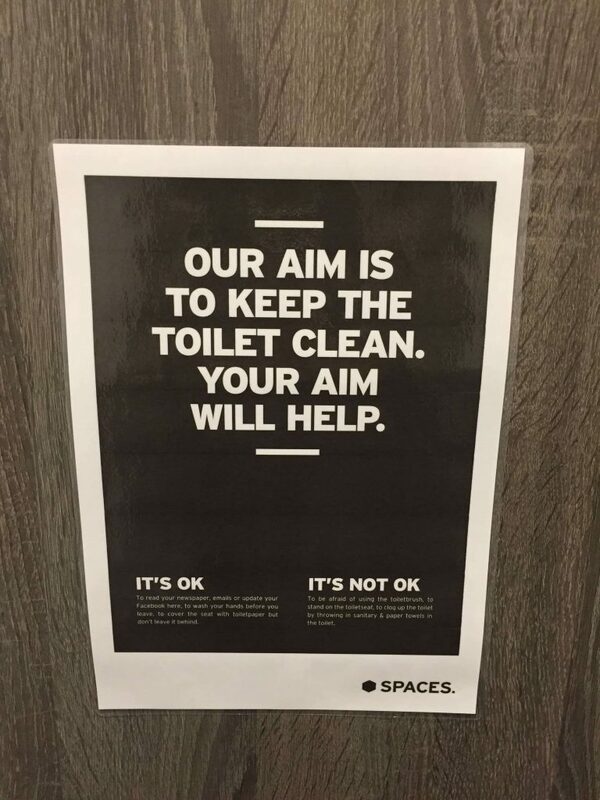 “Our aim is to keep the toilet clean. Your aim will help. It’s ok to read your newspaper, emails or update your Facebook here, to wash your hands before you leave, to cover the seat with toiletpaper but don’t leave it behind. Succinct, effective and right on brand. If you enjoyed this Spotter’s Guide, you can check out some others here and here.